The Runway showcase was preceded by a workshop training, which was helmed and moderated by noted choreographer Ms. Jessica Gomes Surana. The participating Juniors were trained under industry's experts who facilitated them in discovering their best version. 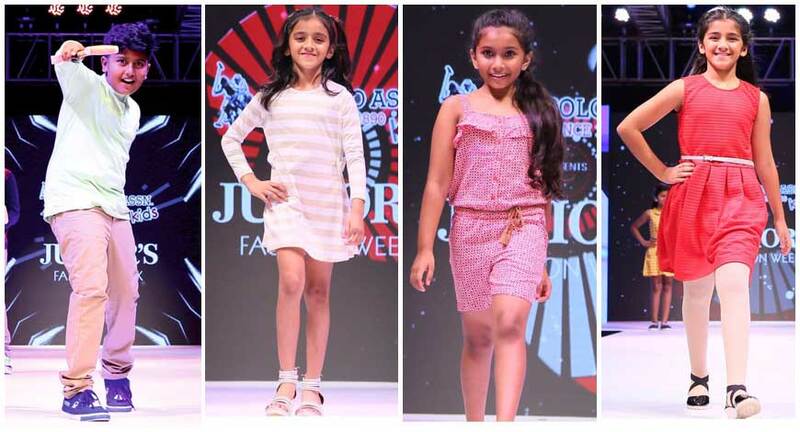 Junior's Fashion Week showcased the collection of international brands including U. S. Polo Assn. Kids, Flying Machine Boys, The Children's Place, Marks and Spencer and ELL Fashionably Young. U. S. Polo Assn. Kids’ showcased a collection consisting of holiday shirts, classic sports dresses in bold and vibrant colors, knitted summer dress, stylish color-blocked smockings, beach dresses and textured party dresses for girls which promise to cater to all their fashion needs. The Children's Place caught eyes as it brought to the forefront a special world of beach themed shirts, nautical prints, and tropical shorts. Affirming the quote “Being kind is the new cool”, TCP ushered in pastel colored pants, cool shorts, and striped shirts, permeated with summery vibes. Flying Machine Boys' Spring-Summer collection drew inspiration from some of the signature designs of Flying Machine. The styles were combined with catchy, contemporary trends in children’s fashion. The entire range was groovy, cool trendy for the young boys. Mr. Alok Dubey, CEO, Lifestyle Brands at Arvind Lifestyle Brands Ltd., says, “We are pleased to have partnered with Junior’s Fashion Week for the 3rd year in a row. It is a wonderful platform for us to showcase our Spring Summer collection for 2018, that is a perfect blend of the classic American style that USPA stands for and the preferences and needs of the Indian audience." Marks and Spencer showcased a fresh burst of colour, and airy silhouettes. Girls’ wear saw romantic bohemian influences with seasonal trend details such as ruffles, smocking, floral prints while Boys' wear saw strong athleisure pieces, vibrant clean colors, technical fabrics, underpinned by sports aesthetic. ELL showcased an Indian ethnic collection, which happens to be the brand's USP ever since it's commencement. Girls wear choice included the Anarkali churidars, ghagra cholees in handwork and embroideries, embellished gowns and ornate tunics. Boys wear included sherwanis, jodhpuris, indo-western with peshawri dhoti and pathanis. As Gopal Bherwani, the Managing Partner, of ELL Fashionably young puts, "We are proud to be associated with Junior's Fashion Week as this is the platform which outreached our brand to a larger audience, and showcased our collection with a brand-oriented perspective." The show had in attendance like global brand representatives, influential mothers, HNI buyers, bloggers, notable media channel representatives, making the event a glitzy yet child-centric affair in town.